Steelhead Spey Schools Become a master steelhead angler. Whether you are a beginner starting from scratch or want to reinforce your skills, these classes will help you get your Spey game on. By popular demand, Entry Level Classes are extended through 2019! Currently all Spey Schools are open to book. We offer the shortest path to success in catching steelhead while Spey fishing. We know that steelhead are often uncooperative and unpredictable. That is why they are such great sport fish. It takes skills to get them, and acquiring those skills takes dedication and a good plan. Many anglers stop halfway to their goal because they're not able to lay out a comprehensive plan. Now you don't have to, because your plan has been designed by a team of anglers who have landed hundreds of steelhead with flies in the most traditional manner. No, we're not talking about side-drifting with a slinky on the end of your fly line, nor are we talking about harassing spawners with glo bugs and split-shot. We are talking about swinging flies with a Spey rod for bright moving fish in the most respected fashion possible. There is probably no more experienced steelhead fly angler than Mark Bachmann. He is joined by Hawkeye Hawkins, a highly skilled guide and affable teacher. Together, they are a formidable team to help you get to the finish line. Our plan is as simple as it is effective. First you'll learn to cast precisely. You can only catch a fish when your fly is in the water and you can only catch fish that you can reach. Then we'll teach you how and where to find your prey. Next you'll learn to present the fly properly to the prey, covering vast amounts of water in the most efficient manner. The method is academic: show the fly to the largest number of fish in the shortest period of time in the most enticing manner. When you finish our curriculum, you won't have many doubts about how it works. Winter steelhead are available in fishable numbers by mid-November, and they remain in good numbers most years through April. During April they are joined by summer steelhead, and by mid-May by spring Chinooks, which peak around the end of June. There are still plenty of fish around in July when the main Sandy river turns gray with glacial melt. By then, we are fishing either the Clackamas or Deschutes where fresh, aggressive remain in good numbers through November. 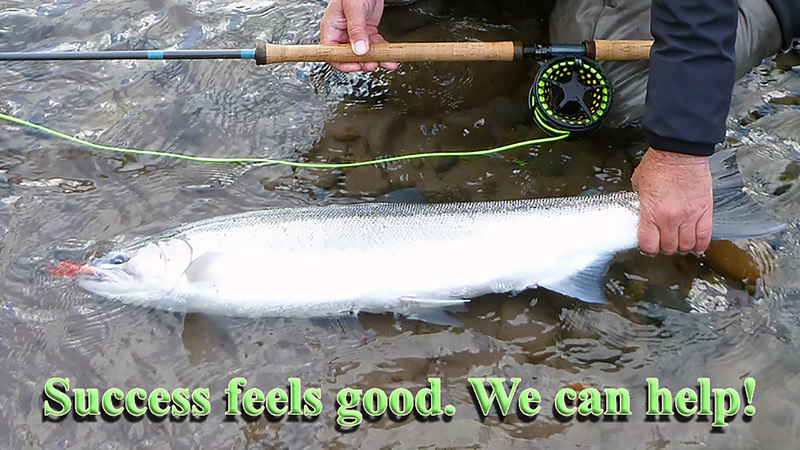 Yes, here in Oregon, in the lower Columbia River basin we are blessed with fishable numbers of steelhead year around. Deposits are payments in full and are non-refundable unless water/weather conditions prohibit class. We take our schools seriously. They are the best of their kind that you can attend. In order to coordinate students, equipment, and instructors with a minimum of problems, we stick to an exacting schedule and curriculum. In order to maintain an atmosphere where teaching and learning can be done efficiently, disruption has to be kept to a minimum. In group classes, no alteration in starting time or place will be made for any individual. Show up on-time, organized, and ready to be part of a team effort. Scheduling a class involves scheduling instructors' time and in some cases, scheduling support people. Once your deposit is received, those people are reserved for you. When we accept your deposit we have formed a contract to serve you. You have signed a contract to attend. If classes are not booked with the minimum number of students to hold a class (or float) seven days before the class starting date, students will be notified and the class may be subject to change - and may be rescheduled to the next session. If less than the minimum number of students needed to hold a group class are registered, the class can still be taught, but the cost will be according to the number of individual students per instructor. A properly balanced Spey outfit and flies will be provided, though you may bring your own if you like.